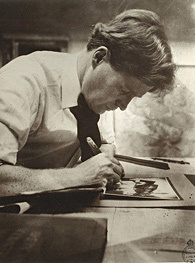 Walter Burley Griffin was born in 1876 in Maywood, IL. An 1983 recipient of OPRF High School's Tradition of Excellence Award, he then received his degree in architecture from the University of Illinois in 1899 and immediately went to work at Steinway Hall in Chicago where he met Frank Lloyd Wright. He soon became employed at Wright’s Oak Park studio and stayed there until 1905. In 1911, Griffin returned to Steinway Hall and opened up his own practice, focusing primarily on residential buildings. Griffin would eventually meet and marry Marion Mahony, who had worked for Wright on and off for 14 years. The two formed a lifelong partnership, both personally and professionally. Mahony was an outspoken, dramatic woman and the only female draftsman in Wright's studio. Mahony was the second woman to graduate with a degree in architecture from the Massachusetts Institute of Technology and the first licensed female architect in history. In 1912, Griffin won a competition to design the new capital city of Canberra, Australia. He and Marion left in 1914 for Australia to oversee the design and construction of the capital city along with other commissions he had already received. Griffin and Mahoney remained in Australia for over 20 years practicing architecture before moving to India to design the University of Lucknow library building. It was in India that Griffin died of peritonitis developed from a ruptured gall bladder. There are no Walter Burley Griffin designed homes in Oak Park or River Forest. Most of his prairie school designs were built in Chicago. In Chicago’s Beverly neighborhood, for example, there is a street named after Griffin who designed many of those homes in that area in the early 1910s. Click here to find out more about Marion Mahony Griffin.